The war between Santa and Rudolph is coming to a head with the third installment of their epic battle, Return of the Rudolph. For those of you who have played Rudolph's Revenge and Santa Strikes Back, you know the fun and excitement awaiting you in this new online slot machine. For those of you who haven't, get ready for one of the funniest, most entertaining, Christmas themed slots online. In this new slot, Rudolph is back with a vengeance, and taking the Christmas themed antics to a whole new level with some of the great features you will recognize from the previous two games along with a brand new bonus round feature. Play Return of the Rudolph today! Return of the Rudolph offers 50 fixed paylines and a maximum allowed bet of $250 per spin. There is a random progressive jackpot award and a max payout of 50,000 times your bet per line. This new slot machine offers the auto-play feature, allowing you to specify when the auto-play will complete, whether you want to stop when you balance reaches a certain, when you trigger the free-spin feature, or at some other trigger point. Return of the Rudolph offers three special game features; the Santa Strikes Back! Feature, the Rudolph's Revenge! Feature, and the Rudolph's Rampage! Feature. 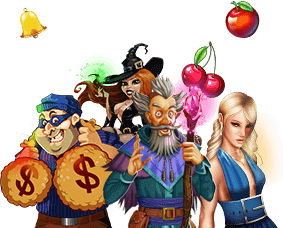 Each of these features offer extra free spins, more chances at winning, and huge payout rewards. The features are triggered when you hit 3 or 4 scattered 'Thugs' anywhere during a normal or free spin. Return of the Rudolph is your standard multi-line slot machine and the same basic rules apply to play here. Always bet all lines, whether for a penny or a dollar. You don't want to miss out on the big hits and free spins will pay more when playing all lines. Don't over bet. It takes time to hit when playing online slots, and patience is almost always rewarded. Better to bet lower so you can play longer and are still in the game when the big payouts come around. Don't walk away from the auto-play feature. When you have the auto-play feature engages, never walk away from your computer for too long. You could miss a big hit and the machine could play it back down without you even realizing you had been winning. Substitute: the substitute icon serves as a wild symbol substituting for any other symbol in a winning combination. Scatter: three or more scattered symbols appearing anywhere will trigger the Bonus Feature. Progressive Jackpot: the Progressive Jackpot is triggered completely at random.